It has always been a source of wonder to me that Australia's early free settlers left Europe on a dangerous voyage to an even more dangerous land; not knowing what they would find when they got there, unprepared for the new world's flora, fauna and Indigenous inhabitants and totally unsuited for the seasons being in reverse and much hotter than whence they came. Many of them overcame all of these trials and collectively made the country that we are so proud of today. One local story concerns the McConnel family on whom we have touched before in this earlier post about Bulimba House, the residence they built in Brisbane around 1850. David McConnel was born in Manchester in 1818 and emigrated to the Moreton Bay colony in 1840. In 1844 he established his station Cressbrook in the Upper Brisbane River near the present town of Esk. Intended to be a sheep run but found to be unsuitable for that purpose, Cressbrook became a shorthorn beef stud. Cressbrook today is still in the hands of the McConnel family. According to its web pages it is Queensland’s oldest residence, Queensland’s oldest identified family business and one of Australia’s third oldest identified family businesses. In this post I want to look at the life of David's wife Mary McConnel in the early days of Cressbrook. David made a return visit to the Old Country in 1847, and in 1848 married Mary, a Scot, in Edinburgh and they arrived back in Moreton Bay in 1849. The house at Bulimba was their Brisbane base and some reports state that initially Mary stayed in Brisbane for health reasons, although she did live at Cressbrook later on. 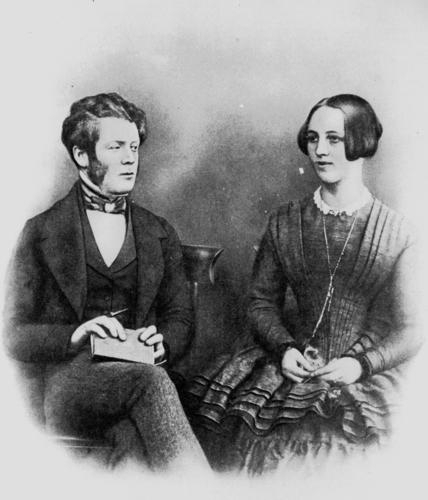 Here is an undated photograph of the couple. Can you imagine what life would have been like in the 1850s on a cattle property four day's ride from Brisbane? Let's start with the obvious things we take for granted today - no telephone, no electricity, no sewerage, probably no running water, transport by horse and/or buggy, no access to medical help and supplies to be imported from Brisbane or Ipswich. No church for the deeply religious McConnels and no school for any offspring. And for a woman living far from home in a totally unfamiliar environment, I imagine, a sense of loneliness. The Cressbrook homestead had been a school room during the week and a church on Sundays. Mary herself taught lessons and Scripture, then hired a full-time teacher; she started a library and held a weekly mothers' meeting - all the while being the mistress of the house and attending to its associated duties and entertaining visitors. Tragedy in the form of the death of two infant sons led Mary to contemplate child health and welfare issues. She campaigned for a children's hospital and started fundraising. On a trip to the UK she visited children's hospitals to observe their methods of operation, and with the help of her brother, a doctor, enlisted staff. 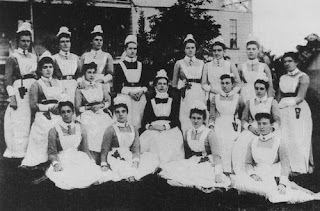 When she returned to Brisbane she was able to oversee the opening of a children's hospital in a modified house in Spring Hill in March 1878. This facility was later transferred to Bowen Hills and became the Royal Children's Hospital. Here is a photograph of the hospital's nursing staff from around 1895. Much of Australia's pioneer history has been written about men. Women like Mary McConnel deserve to have their story told too. In a harsh environment and with few tools compared with today's households they were the backbone of the country. David McConnel died in June 1885 and Mary McConnel passed away in January 1910.